Homemade sausages – yummy. 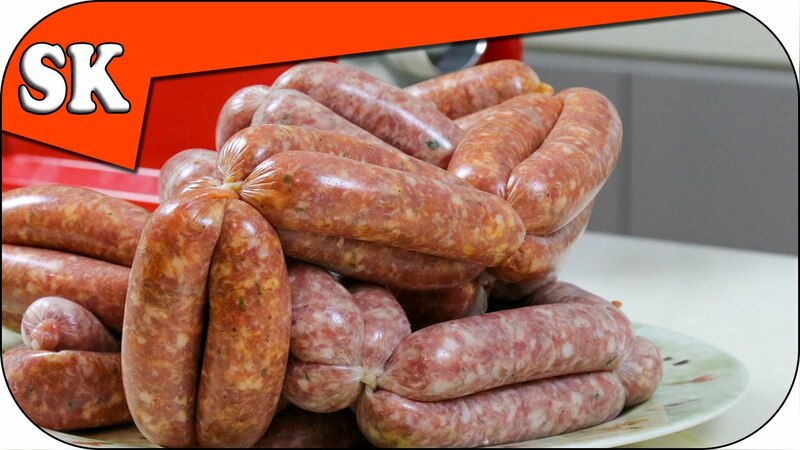 In this video I show you how easy it is to make sausages at home. They are not so difficult to make and you can add whatever flavours you like. Get the whole family involved and mix up some new flavours. Nothing beats a good additive free Banger and if you don’t know what a banger is, I suggest you Google Bangers and Mash. I used fresh Herbs in my sausages. Spice them up with what ever you like. To begin to make sausages you need to prepare the meat to be minced. You can either ask your friendly butcher if he will do this for you if you don’t have a meat grinder or grind it yourself. To prepare for grinding you will want to cut the meat into pieces that will fit in the shoot of your grinder. Then using a coarse setting push the meat (and the extra fat if you are using some) through the grinder into a big bowl. Once the all the meat has been processed I clean the remaining meat out of the machine by pushing through a slice or two of bread. This clears all of the meat out of the machine and it doesn’t harm the sausages to have a little bit of bread in them. Now is the time to add all the herbs and spices. Stir into the meat. Fix a finer grade grind onto your machine and push all of the meat with the flavourings through once more to get a finer sausage. At this point you can check to see if you have the right amount of flavour in your sausage, by taking a small patty of the meat and frying it in a pan. Taste it and adjust any seasonings that you may feel the sausages need. What you taste now is the final flavours of your sausages. Prepare whatever machine you have for stuffing your sausages. Place the skins onto the end nozzle and gently fill with your prepared sausage meat. I let the filled casings fall onto a large tray as this makes them easier to move around. Tie a knot in the end of the casing once it is full. Don’t over fill the casings and take your time it does get quicker and easier the more that you make. I think to learn how to twist into sausage links it would probably be easier to watch the video as I think I may confuse you if I attempt to write it all down here. I start to twist into sausage links at about the 7 minute mark of the video. Once you have your sausages all nicely twisted divide into portions and wrap in cling wrap. 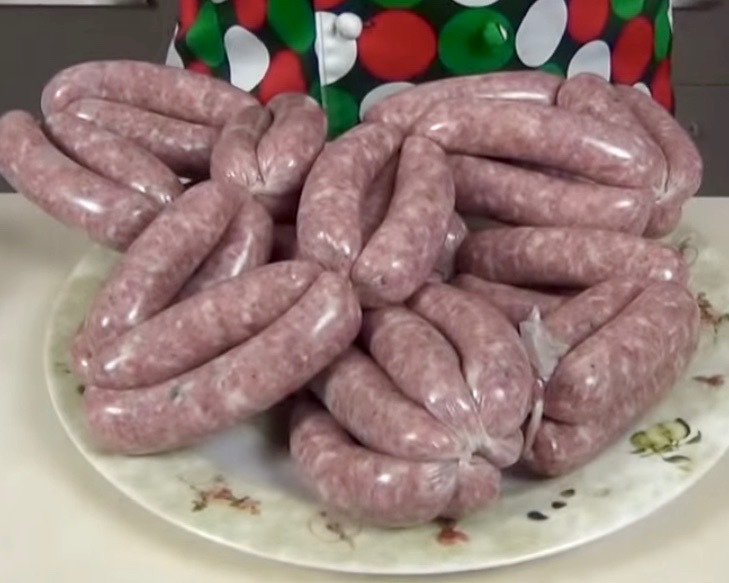 I always make lots of sausages when I make a batch and freeze my them. That way I always have sausages in the freezer when I want them. If you make different flavoured sausages don’t forget to label them before placing them in the freezer or you may just have to take ‘pot luck’ when you come to use them for a meal! Awesome video! I know you’ve heard that probably a hundred times or more, but it is. I wanted to ask you, after you’ve twisted and bunched the links together, how do you separate them into smaller groups for packaging and freezing? I have been tying mine and that is a real pain but I am afraid if I don’t, they will untwist and the meat would come out. I usually vac pack them in groups of five links, how do you separate them when they are all linked together as in your video? It seems like if you would cut them, they would untwist and fall apart. Thanks for commenting, glad you enjoyed the video. We cut them into groups of six and freeze them whenever we make sausages. The collagen cuts easily and the sausages stay intact, no problems at all. Just allow the sausages to rest for an hour or so in the fridge before cutting and I am sure they will be great. Pingback: How to Smoke Succulent Sausages - This is the Best Way to Do It!